When you begin to grow your own food, you may visualise a beautiful vegetable garden ready to be showcased in a magazine spread, filled with vibrantly-colored herbs and flowers, whose image fills your heart and soul with a great appreciation of the abundance and harmony of nature. A few months later, when you look out the window and see nothing but haphazardly placed pots, more weeds than vegetables, and you trip over your garden tools, you may wonder why you started a garden in the first place. With a little effort, you too can have a beautiful vegetable garden that is organised and ship-shape. It is easy to get excited when you first begin a garden. You may have gone to the home and garden store and filled your cart with every tool imaginable, ready to be prepared to take care of any weeding, tilling, or planting project that strikes your fancy. Neighbours and friends might have donated old tools that had been kicking around in their garages and barns to help you with your gardening aspirations. Before you know it, you have piles of tools that seem to get in the way and create an eyesore more than they help. First, be honest with yourself about the amount of tools that you actually need. Even the largest garden does not require more than a couple of basic tools to get the job done. A good shovel, hoe, watering supplies, gloves and small hand rake for weeding should be the basics. If you find that you have accumulated 5 different shovels and 12 different rakes, it’s time to do an inventory check and donate what you don’t need to a new gardener who does not have anything. Create floor space by hanging everything from the ceiling of a garage or barn if you have one. If you don’t have a place to hang your supplies, an old oak wine barrel with the top part cut open placed next to your garden or compost bin makes a visually pleasing option to organize your shovels and rakes. You probably have a deck garden because you don’t have the land to plant directly in the ground. But deck gardens have a tendency to start small and take over, leaving you less and less room to actually sit outside and enjoy the little outdoor space you may have. Place pots on multi-level stair step shelves to take advantage of vertical space. Don’t overlook the opportunity to grow creeping plants that can use vertical wall space or posts, such as certain varieties of beans or grapes. Invest in a gorgeous large ceramic pot and plant complimentary plants together, such as tomatoes and peppers, making one visually striking piece on your patio as opposed to a disorganized mess of many little plastic pots cluttering up space. If you have many pots, try to keep them all in the same colour or style, such as all terracotta ceramic pots. This makes your deck garden seem more cohesive and intentional instead of a mess of random pots that took over your patio. Any beautiful garden has thoughtful design, and its gardener puts as much thought into the layout as the care of the plants. Start by defining your garden edges. If you need to keep certain animals out, maybe look into building a charming picket fence in a colour that either seamlessly blends into the environment or stands out as a piece of art, depending on your taste. If animals are not a problem, collect large, beautiful rocks and make a perimeter of those. A perimeter could even be of a certain plant such as lavender, which is not only useful, but gorgeous as well. Within your garden space, create well defined rows of either polished stones or mulch and create sections of your garden, as opposed to one large unorganized mess of plants growing on top of plants. Keep everything well pruned, and make sure that plants such as watermelon or pumpkin don’t get out of hand and take over in all directions if you don’t have the space for them to do so. 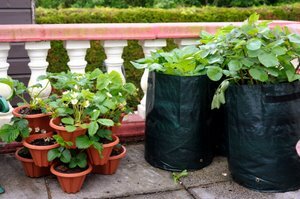 The plastic information spikes that may have come with your seedlings are helpful, but create an eyesore. If you like to use these markers, make small handmade ones of wooden popsicle sticks. These don’t stand out so much and let your eye rest on your plants, not on the ugly plastic info cards. A visually pleasing and well-organised garden space will lend an air of harmony, making you want enjoy working in your garden even more. By keeping a sense of order in your gardens, you can focus on the splendour of the plants and the experience of working close to nature and enjoying its bounty. After all, wasn’t that the whole point of having a beautiful vegetable garden in the first place?